Today I have swatches of the Sephora Nail Wand in Silver for you. I'd been curious about this for awhile, so imagine my surprise and delight when it showed up on my desk last week! Keep reading for more swatches and my impressions of all four colors. 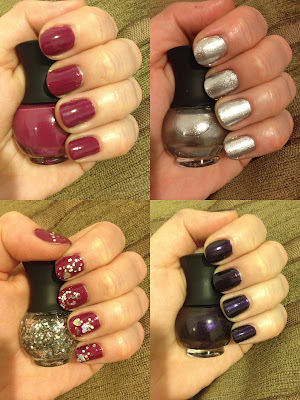 The most fun part about this collection of nail polishes is that they come snapped together in a long row. You can either keep them like this for storage and/or display purposes, or you can take them apart to play with. But it's like Legos for beauty lovers, wouldn't you say? Electro Shot is a deep blue-purple with a hint of shimmer. In most lights, it appears almost black and the shimmer is basically non-existent. It's a bold color and it's fun, but I wish the shimmer was more visible. Silver Glitter is, as one might guess, silver glitter! I wanted to love this one, but the glitter was incredibly hard to get out of the bottle -- I really had to dig to make any of it come out onto the brush, and that was just for the normal pieces of glitter. If I wanted the holographic hearts on my nails, I had to pour out a bunch onto a plate and pick them out with a bobby pin. It makes for a fun sprayed-on glitter look, especially with the hearts, but it would have been nice if the glitter was easier to get out of the bottle. The polish also walks a fine line between being fun and being just a little too much. Closeup of the silver glitter. Aren't the hearts fun? Mirror Mirror is definitely my favorite of the four. It's a dense silver shimmer/glitter with a mirrored finish. I was impressed by the formula and by the fact that it didn't show any brushstrokes on the nail. Definitely a glitzy option for holiday parties! Closeup of Mirror Mirror. Love the glitter/shimmer hybrid finish! Red Berries Smoothie is a creamy, opaque mulberry. It definitely looks darker on the nail than it does in the bottle. It applies easily and smoothly and it's pretty, if a bit basic. A good deep pinkish red to have in your collection if you don't already have a match. The Sephora Nail Polish Wand in Silver is currently sold out on Sephora's website, but the Gold version is available for $12 here. Hopefully the Silver one will be back soon!